As you no doubt know from news coverage and articles in the press and online, 2014 marks the 100th anniversary of commencement of hostilities in what became known as the First World War, World War I or the Great War—dependent upon your country of origin. It was the twentieth century's first world war, and it brought to an end the first great age of globalization. Indeed, according to Winston Churchill, it was the first war in which man realized he could obliterate himself completely. To this day, it is not just the sheer numbers of dead and wounded, both military and civilian that stuns us, but the devastation of place, of entire families and villages—the fact that a way of life was brought to an abrupt end for so many. As many readers know, I have been deeply interested in this war since childhood. Though I could not articulate it at the time, it was seeing my grandfather suffer the after-effects wounds sustained at the Battle of the Somme that inspired my curiosity. He had been gassed and shell-shocked, and sustained severe leg wounds—that dear man was still removing shrapnel from his legs until the day he died age 77, some fifty years after that battle. If you've read my second novel, Birds of a Feather, you will remember the character Lady Rowan Compton saying, "That's the trouble with war, it's never over when it's over—it lives on inside the living." I think I felt like that while watching my grandfather, knowing this terrible event had caused such pain to a much-loved grandfather, and by default to all of us. But our family was not alone—almost every family in the United Kingdom was affected by that war, as were millions of families in countries across the world. 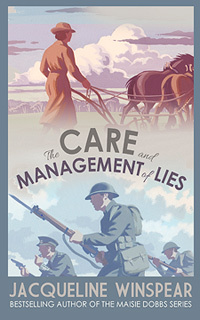 On a personal level, this year marks publication of The Care and Management of Lies—a novel about the Great War I have wanted to write since I was twenty-five years of age. 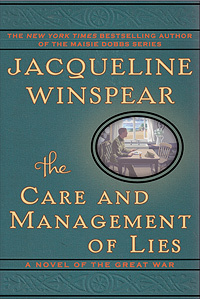 For those of you wondering about Maisie Dobbs, the ex-WWI battlefield nurse who in the 1920's becomes a psychologist and investigator—do not worry; she will be back in a new series in the spring of 2015. In the meantime, go back over the series and you will see how so many aspects of life in the 1914-1918 war are reflected in Maisie's work in the late 1920's and early 1930's—there are ten novels in the series now, providing plenty of reading and re-reading material!